« A Robot Army Walks Into A Bar….. 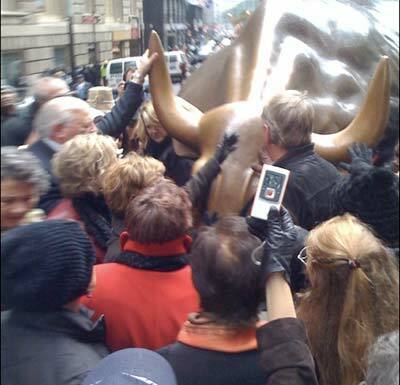 I recently read an article about some Christian fanaticals who decided it was time to get in touch with the bull on Wall St. and make him change his ways. Hilarious stuff. Lots of comments from this post which add to the laughing stock these people become. It makes me realize that no matter how sophisticated we think we are, we’re still very primitive and ritualistic. It also makes me think of the election. We’re about to go into the polling booths on Tuesday and vote for…… who? The way people adore and adulate Barack Obama, you would think he is the next coming of the savior himself. I won’t elaborate on this, because I’ve posted about it before here. Where’s Charlton Heston when you need him? Have you ever read that story in Exodus when the Hebrews worshipped a golden calf they made for themselves? This is the kind of stupid junk a few Christians do that make all of us look bad.